A pinboard is a vital component to collect and exchange ideas and thoughts. Wherever people plan, meet and create... simply share your thoughts by pinning your ideas to the wall. Sometimes in office design, pinboards are almost an afterthought. Pinboards (or noticeboards) are colourful adding a buzz and energy to any meeting space. Plus they reduce harsh acoustic levels in areas where hard surfaces are used. A single notice board can become cluttered and unused. Don’t cram too much information on one board. Use multiple pinboards so your information is easily viewable. You can choose to integrate pinboards with writing boards to create a dramatic and aesthetic communication wall. Available in either a wrapped frameless finish, standard aluminium frame or EDGE LX7000 architectural. 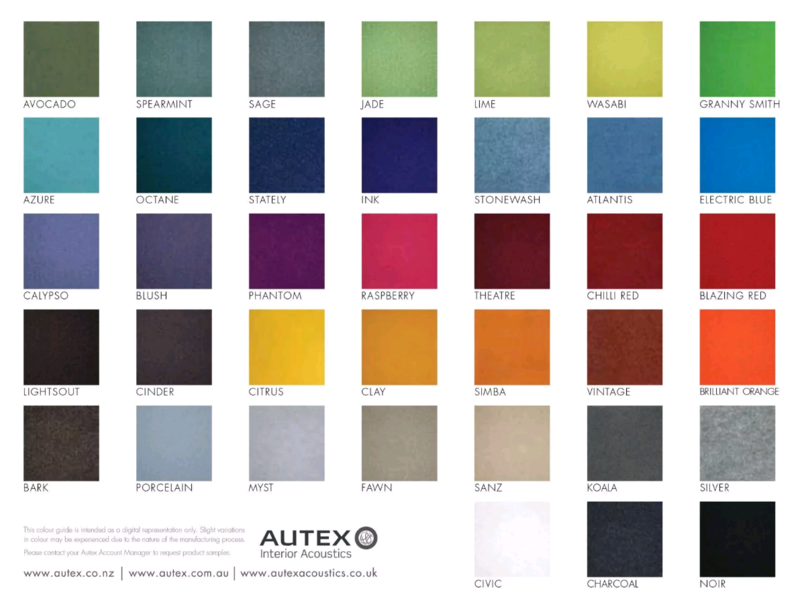 VELOUR: Woven polyester fibre made from 60% recycled content. Excellent sound absorption index of 0.4— which means that 40% of sound is absorbed. Velcro receptive as well.